L1 is an intensive two-day workshop (12 hours total) where you’ll learn all 30 Level 1 moves, including regressions, progressions, and variations for all skill levels. You’ll explore how and when to use each movement individually, as well as how to link them together into flows of your own design. This is also your first step toward becoming a Certified Animal Flow Instructor or Specialist. You can find the details on the Certification process and benefits HERE. You’ll cover all 6 elements of Animal Flow, including the Traveling Forms (the “ABCs” of animal movements); Switches and Transitions; Wrist Mobility; Activations; Form Specific Stretches, and, of course, Flows. The workshop starts with base positions, which systematically build in difficulty and complexity over the two days. Movements are taught within the context of scientifically-based concepts relevant to anyone working in health and fitness industries. Read about the Six Components of Animal Flow, the specific movements covered in the workshop, the course objectives, and more about Level 1 in general HERE. – Access to the private AF Instructors Facebook group. – Certificate of Completion, including proof of participation for Continuing Education credits. The workshop is open to persons of all skill levels. You should be physically fit enough to support your own bodyweight in quadrupedal position, and be medically cleared to participate in physical activities. Upon registration, you will receive a welcome video with some practice exercises to help you prepare your wrists for the course. The Level 1 course is approved to provide continuing education credits from: National Academy of Sports Medicine (NASM) 1.1 CEUs; Athletics and Fitness Association of America (AFAA) 11 CEUs; UK Registered Exercice Professioanla (REPS) from PD:Approval 10 CPD; New Zealand Registered Exercise Professionals (REPs) 13.75 5 CPDs; UAE REPS; Canfitpro – 8 canfitpro CECs (Assesement & Exercise Portion: 4 PTS; Program Design Portion: 4 PTS); Fitness Australia – 9 CECs pending renewal; Physical Activity Australia 3 PDPs. This workshop will be taught by Animal Flow Master Instructor Andrew “Chaddy” Chadwick. 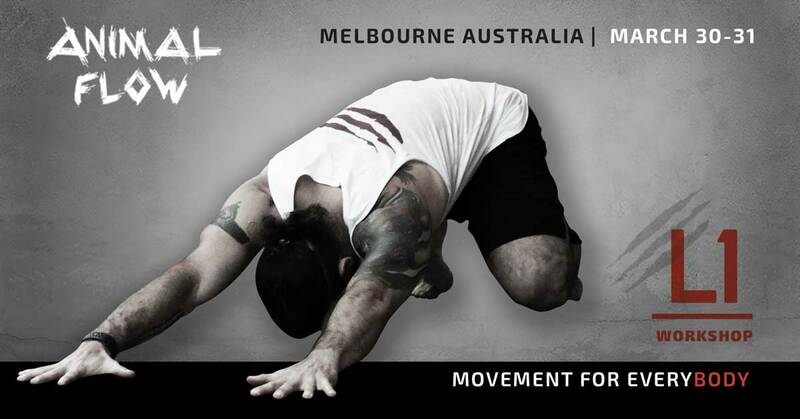 The event will be hosted at Primal Moves Melbourne, the brand new movement facility opening in February 2019. Regular cost for the Level 1 Workshop is $475 USD. (Currency conversion is done automatically during check-out).Early Bird pricing of $445 USD is available until January 1. You will receive the code for your free Animal Flow 2.0 video in your confirmation email.